A glamorous dog collar with 3 rows of handset Aurora Borealis Crystals on faux leather with sparkling glitter that has a laminated seal, so the sparkles stay intact. This collar is 1" wide and available in a variety of nine colors. Decorated with a rhinestone encrusted buckle and a D-Ring for tags or leash attachment. The perfect bling dog collar! How does sizing work for these collars? 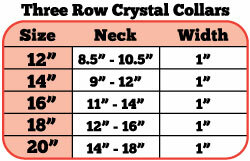 Size 12 will fit a pet's neck from 8.5"-10.5" Size 14 will fit a neck size from 9"-12" Size 16 fits necks from 11"-14".In other words, the sizing is for collar length, not neck size so please check with size chart before ordering.